Konami (TYO:9766) is expecting a strong year. This is the major takeaway from their Q1 financial results, released two days ago. The reason behind this is also the reason the company has shown a fall in profits, despite growing revenue. Reportedly, this is as a result of increased spending on research and development in the company’s Digital Entertainment segment. Revenue for the company has increased by 4.9% year-on-year, from ¥55.7 billion to ¥58.5bn. From this, the company has actually seen profits fall by 3.1% from ¥12.2bn to ¥11.8bn. The primary driving factor behind both the increase in revenue and also the decrease in profits is the Digital Entertainment (video games) segment. This segment saw growth in revenue of 4% from ¥28.9bn to ¥30.1bn, though profits fell from ¥10.4bn to ¥9.1bn, a fall of 13%. Outside of Digital Entertainment, the company has three main segments. Health and Fitness is the second highest segment. Konami runs a number of health and fitness clubs in their home nation of Japan. This quarter they have also opened three fitness clubs, as well as starting and expanding schools dedicated to table tennis and trampolining. Revenue here well by just ¥0.3bn, or 1.9%. Profits, however, did grow by 67.3% from ¥0.6bn to ¥1bn. Amusement, which covers arcade and Pachinko machines, has seen a huge 43.1% growth in revenue from ¥4.6bn to ¥6.6bn. Profits, despite this, have raised 15.6% from ¥1.6bn to ¥1.9bn. Amusements, however, do only account for just over 10% of the company’s revenue stream during the quarter. Gaming and Systems (gambling machines) bring up the rear, having fallen 1.9% in revenue, or ¥0.1bn to be exact. Profits did, however, raise by 7.9% by ¥0.1bn. 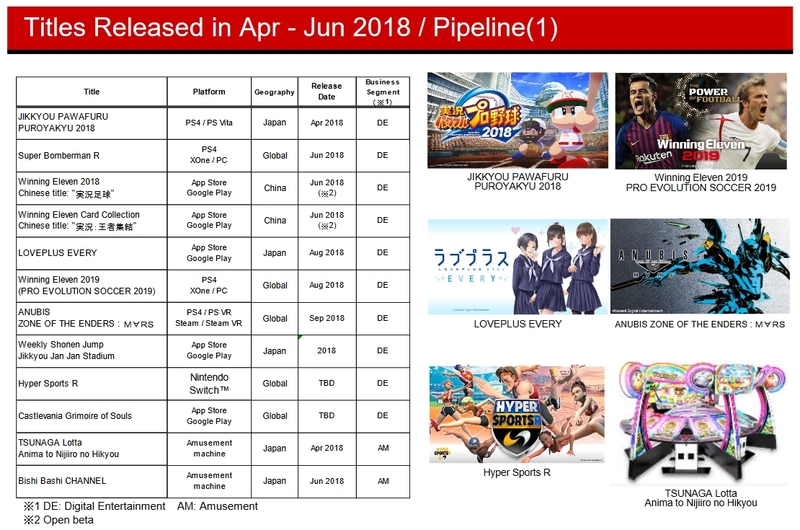 For the three months ended June 30, 2018, total revenue of Konami Group continued well due to strongly performance of the latest title in the JIKKYOU PAWAFURU PUROYAKYU series of the computer and video games and the mobile games in the Winning Eleven series based on the stable sales of the existing top game machines and titles, and new products of the amusement machines launched into the market. On the other hand, the operating profit was almost same (slightly decreased) as the same period of the previous fiscal year mainly due to advance investments, including promotions to invite new users and researches and developments. It should be noted that this primarily covers the Digital Entertainment segment for the company while touching on Amusement. All segments are covered in more detail within the full release linked earlier. For Health and Fitness, the loss of revenue has been attributed to the closure of stores during the quarter. However, the closure of these stores, as well as improvements in energy saving and business efficiency has been explained as the cause of an increase in profits. This will continue to help the segment over the year and the near future. in addition to this, an expanded lineup of Konami Sports Club Selection products are sold on the redesigned online store. Within Amusements, the potential for consumers to spend even more is with a digital payment system the company has now introduced. This system, called the Thincaterminal multi-electronic money payment system, will make it much easier for people to play amusement machines that use the Konami electronic currency, whether in a Konami based structure or on a Konami machine used elsewhere. For Gaming & Systems, the company has noted that the exchange rate was an issue for revenue, as well as the decrease of new-machine installations. Hopes are that further integration of their systems overseas and on cruise ships will increase the revenue of the segment. More than this, the company is hoping to appeal to a younger audience with new machines that reflect player skill levels. Being better at a game then, naturally, increases your chance to win. Konami has also begun to allow eSport betting on their machines. Digital Entertainment, for Konami, covers video games of all kinds across all formats. The company doesn’t differentiate between console and mobile titles, which makes sense after Konami effectively retreated from premium-priced console titles. Nine months ago I covered the fact that a renewed push in Digital Entertainment would look to grow the company further. While the effects of this haven’t been seen greatly, boosts have been noted. Of course, the belief is there in the segment, thus the extra investment given to future titles. Time and patience will be the key factor for video games within the company, as the investment made now will see the best returns years down the line. This year, only Pro Evolution Soccer 2019 is the high-named global release. Other games like Super Bomberman R and Anubis Zone of the Enders Mars are to be released during the year. 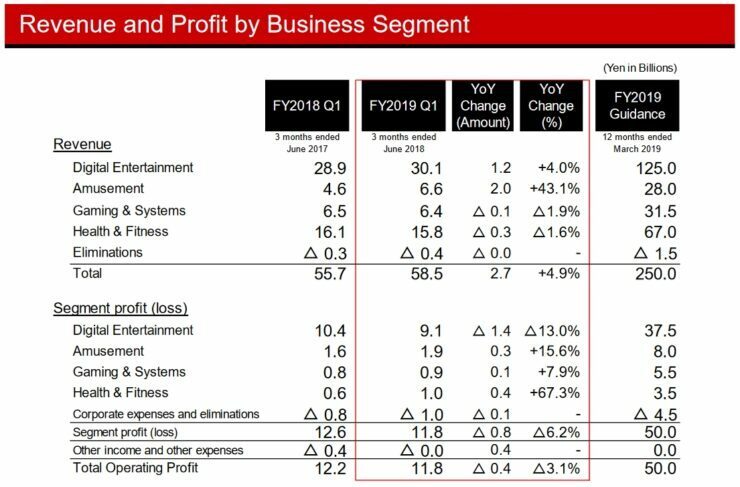 The quarter has certainly been good for Konami, despite a fall in profits, this much is certain. Had they fallen in profit without such a rise in revenue, and had not invested so much in video games, it would have been a concern. This investment, however, shows a push in games – the company’s most profitable segment – that can only benefit them in the long run.